Based on State Law No. 24 of 2011, employer will have to contribute a certain share based on employee monthly wage into the social security funding programme. The programme will provide economic assurance for every employee’s wellbeing. The new Social Security Agency for Workers and/ or Health (Badan Penyelenggara Jaminan Sosial untuk Ketenagakerjaan dan/ atau Kesehatan or BPJS-TK and BPJS-KS) will continue to ensure that employer takes part in the mandatory social security programmes such as Pension Guarantee, Life Insurance, and Work-accident Insurance. 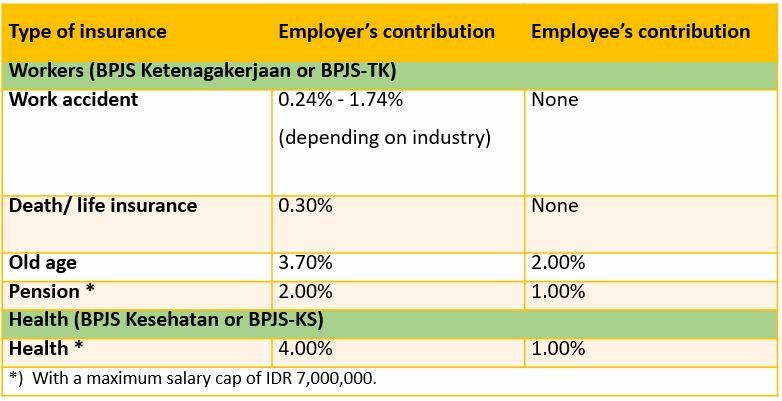 For more information on the details to social security pay-out structure, submission of application, working details, and latest updates please directly contact BPJS for Workers at www.bpjsketenagakerjaan.go.id and BPJS for Health at www. bpjs-kesehatan.go.id.